In 2014, the Premier League is played for the tenth time. The number of weeks to play is extended with one. This means that after 9 weeks, when all the 10 players have played each other once, the bottom two players are eliminated. In the remaining six weeks, all players will have to play seven matches. 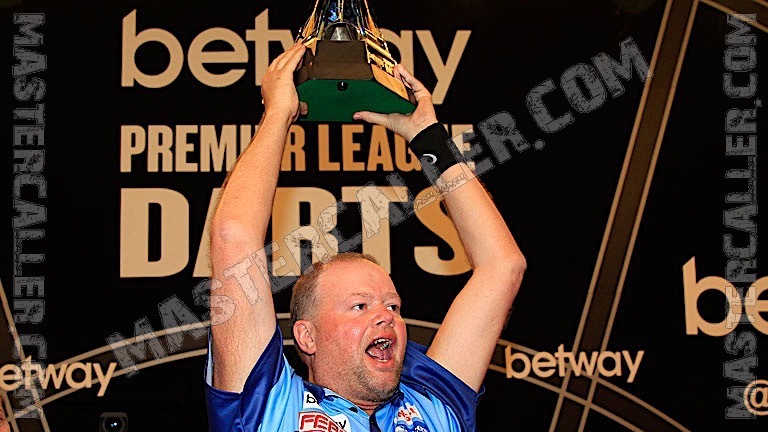 The line-up for the 2014 Premier League was announced as usual following the Ladbrokes PDC World Championship 2014. The top four players in the Order of Merit are automatically invited. The PDC give out four wildcards and the last two wildcards are handed out by SKY Sports who are the host broadcaster of the event. The 2014 Premier League line up was: Michael van Gerwen, Phil Taylor, Simon Whitlock, Adrian Lewis, Peter Wright, Robert Thornton, Dave Chisnall, Wes Newton, Raymond van Barneveld and Gary Anderson. For the second year in a row Wes Newton drops out after 9 weeks, this time together with Simon Whitlock. The two Dutch participants play excellent, the same as last year. Van Gerwen finishes top of the league for the second year running and Raymond van Barneveld takes second. It's an extraordinarily exciting competition in which Phil Taylor still manages to make the playoffs after he has lost four of his first five games. Gary Anderson is also back on form and has as many points as Barney and The Power, but finishes fourth on leg aggregate. Peter Wright is the one who finishes just short. He is top of the Premier League for the first seven weeks, but drops of slowly and finishes in fifth spot. Never before had a player been dropped for the playoffs who had taken as many points as Wright did in 2014. The semi-finals and final were played in London again at the O2 Arena, and in his ninth attempt in the league Raymond van Barneveld finally claims the title. On May 22, he overcomes two major hurdles. In his seventh Premier League semi final, he wins for the first time in history, and he does so against his eternal rival Phil Taylor. For the first time since the UK Open in 2008, 2.174 days ago, he beats The Power in front of the cameras. The final is an all-Dutch affair because defending champion Michael van Gerwen wins his semi-final against Gary Anderson. In the final, the pressure is off for Barney and he plays freely. He beats the number one in the world with 10-6 and adds the Premier League title to his already impressive list of achievements.